We woke up to grey skies and drizzle, and the drizzle/intermittent heavy rain continued through to mid afternoon when the skies went from grey to blue and white. Is this a bad thing…this rain in the midst of harvest??? For us, no. 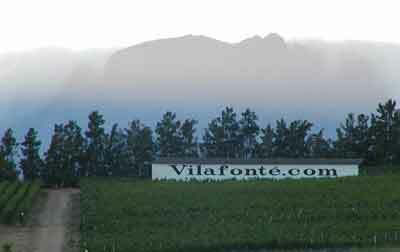 All of Vilafonté is red grapes, and with open clusters and thicker, more rainproof skins. In fact Phil was delighted; the dust will be washed off the leaves and the whole vineyard refreshed. If the rain were prolonged and heavy; if we had white grapes that have thinner skins; if we had Pinot Noir which has tight clusters; the story might be different. But for us, we welcome this cleansing.And previously, I have seen this type of rain seem to "kick" the grapes into ripeness; maybe it is the water; maybe just a warning to them to get on and ripen their seeds (we are interested in the fruit, but the grapevine is all about ripening and distributing its seeds. Well done on the podcasts, it is such a pleasure listening to this in freezing New York City - wish I was there. Will celebrate with a bottle of 'C' tonight!